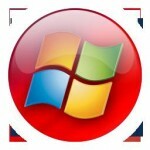 This beautiful Analog Aero Clock is made by Microsoft, featuring the Windows flag on a red round gradient. More colors are available, and since February 2016 great new skins added! If you downloaded the gadget before September 23, 2017, please uninstall it and download this updated version that fixes some display problems of some clocks. Save the .gadget file on your disk to use it later, or run it immediately to add the Analog Aero Clock to your gadgets.